The West and East Rim drives are open only between June/July and October. Check for current status. Arrive at the park via Oregon Highway 62 and stop at the Steel Visitor Center to get maps and get oriented. Watch the film. Visit Rim Village and get the first “wow” of the lake. Continue to Cleetwood Cove Trial and hike the trail down to the lake if able. This is a 1.9 mile trail one way with elevation change of 649 feet. Take the two hour boat tour from Cleetwood Cove for a tour of the lake. Continue on East Rim Drive back to the visitor center; stop at various view points. An enormous eruption 7,700 years ago created Crater Lake, when massive pressure under the 12,000 foot Mount Mazama caused a circle of vents to form and started to spew lava. Eventually, enough vents formed around the mountain in a circular pattern and when enough lava flowed out, the entire top of the mountain collapsed and formed a deep, circular hole. Over time, rain water filled the hole to create a lake. The watershed for Crater Lake is only the lake side of the rim so no sediments or impurities flow into the lake and no external stream feeds the lake. This made the lake one of the clearest in the world. No native fish are in the lake but between 1888 and 1941, 1.8 million fish were stocked. Rainbow Trout and Kokanee Salmon are in the lake today. Water will seep out to keep the lake level within three feet during any given year but no stream flows out of the lake. This gave the lake a unique and isolated habitat. The lake is 1,947 feet deep. The tallest part of the rim is over 1,978 feet above the lake surface. That means the Freedom Tower in New York can stand on top of the water and still not reach the highest rim point. Equally, the Freedom Tower at the deepest part of the lake will not break the surface of the water. 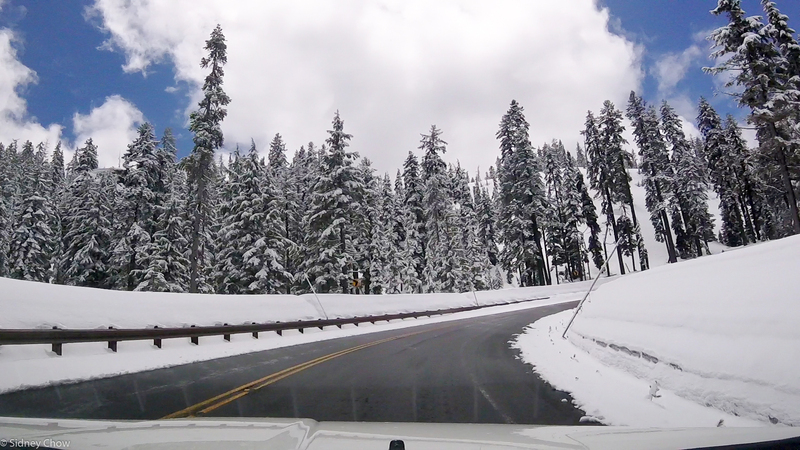 The drive towards Crater Lake National Park from I-5 was pretty and similar to the normal approach to a national park. The closer we got, the more beautiful the scenery. Cars thinned out and the pines got taller. We arrived at the entrance sign with just a hint of snow on the ground. Soon after, as we continued to climb, the weather changed rapidly between sun shine, sleet, snow, and clouds – all within 15 minutes. Snow banks on the side of the road got taller and taller. Soon, snow covered the entire forest. I commented to Loretta. “It must have snowed recently. The pine leaves are covered with snow”. In fact, it did snow the night before with four inches of accumulation. The scene was just like a Christmas card. We continued to Rim Village, three miles up the road. On this day, the only thing that was open was the gift shop and the small restaurant in a three story building. The snow was as deep as the roof line, thus we felt like we were underground. 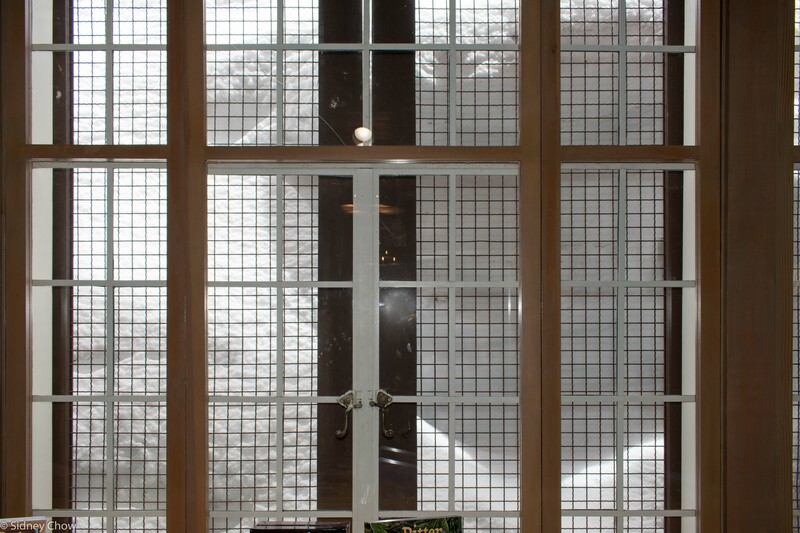 There was a window on the third floor where they cleared enough snow from the window to allow a view of the lake but we didn’t see the lake because of the blowing snow that totally obscured the view. We ate our usual lunch at a national park – Subway sandwich. I said to Loretta. “I brought my wool hat and gloves all the way out here and this is exactly the reason! If there ever was a time to wear them, this is it”. She smirked at me and said “All right, if you must”. The temperature gauge read 27 degrees and the wind was howling. We walked up a snow bank and for a few minutes, the sun was shining even as the wind continued to howl. As I walked up the snow bank, the deep blue water came into view. The snow covered rim flanked the 25 square mile lake. The contrast between the deep blue water, the snow, and the brown rim was mesmerizing. Oh, the blue water! I’ve never seen such blue water before. The few minutes when the sun was fully shining, the color was so blue! The lake is the clearest, most pure, of anywhere on earth. Because the water is so pure, it only reflects blue light, absorbing the rest and that’s why the lake is so blue. There are many places in national parks with the “wow” factor. The first time a fantastic scenery came into view. 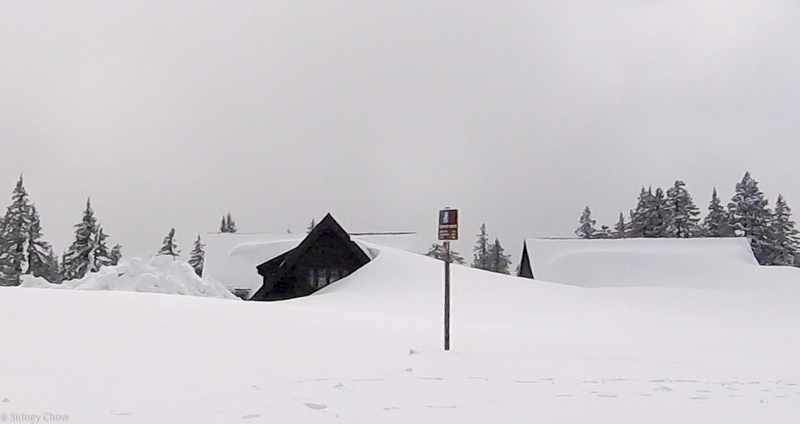 The first view of Crater Lake tops them all. It was jaw dropping. It tops the first time I saw Grand Canyon, the first time I saw Yosemite Falls, the first time I saw the Grand Tetons, just to name a few. Did I mention how blue the lake was? The image was seared in my memory and pictures can not do it justice. I set up my tripod and took some photos of the lake, but the cloud quickly moved in and the wind picked up even more. I was determined, despite the cold, to get some time lapse photos in because the clouds and weather was changing quickly. The camera clicked away on time lapse mode as I watched the weather changed from sunshine to snow to rapidly moving low clouds all in a matter of 15 minutes. The low clouds seemed like it was barely over the rim of the crater. As quickly as the cloud moved in, it was gone and the sun returned. All the while, the wind blew incessantly which made my fingers freeze even with gloves on. With each change in light as the sun and clouds play hide-and-seek, the lake took on a different look and character. When the sun was out, the lake felt tranquil with the bright deep blue color against the backdrop of snow covered rim, and the puffy white low clouds. When the cloud rolled in, the bright deep blue color of the lake turned an angry shade of dark grey and the waves seemed to pick up. The low dark clouds barely cleared the rim. Then the whole lake faded from view as the snow fell, joined by the wind driven snow picked up from the snow banks. The view of the lake at this point is intermittent and nearly disappeared. Suddenly, the sun returned and the bright blue color of the lake was clearly visible again. The weather changed so rapidly it was fun to watch! Even with hat, glove, and multiple layers, I was no match for the freezing wind. After about half an hour, my fingers were frozen, as were my ears. I packed up the equipment and returned to the car. We headed down the mountain. Even after half an hour in the car, my inside was still cold! While we did not get very far on the 33 mile Rim Drive, the one view I got of the lake stayed with me. The scene was awe inspiring, a common phrase used at national parks, but this one is special. The whole park is about the lake and the central feature was spectacular! The view was the definition of pristine. There are multiple view points on the 33 mile Rim Drive with hikes to the top of the rim (The Watchman Trail) or the lake (Cleetwood Cove Trail) where you can take a boat tour. To the northeast of the lake, you can see pumice rocks, spewed from Mount Mazama when it erupted, that are so light they float on water. We visited when most of Rim Drive was closed so we didn’t get the chance to hike those trails. This park is on my list to revisit in the future! Be pure in thought and don’t let impurities of the world influence you, just like Crater Lake is pure and blue because it does not receive impure water from the outside. 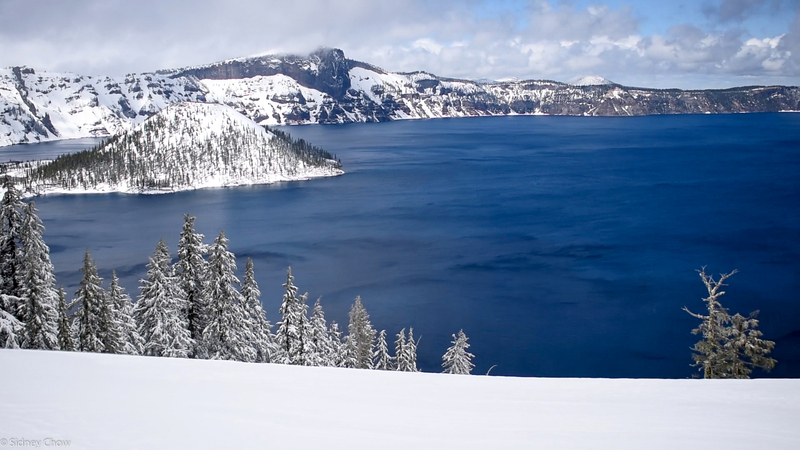 Crater Lake National Park has a single focus – Crater Lake. It is one of the most beautiful places on earth, maybe in the top 10. It’s the Grand Canyon of lakes because of the wow factor. Crater Lake is the deepest, purest, bluest lake in America and by far the most beautiful lake in a national park. While the view is spectacular, this lake is not for recreation. The water temperature is a cold 55 degrees F at the surface and 38 degrees F at the bottom, far too cold for water sports, not to mention the pollution problem. This lake is an excellent laboratory because it is so isolated. I plan to visit again in the future to see all of this park. 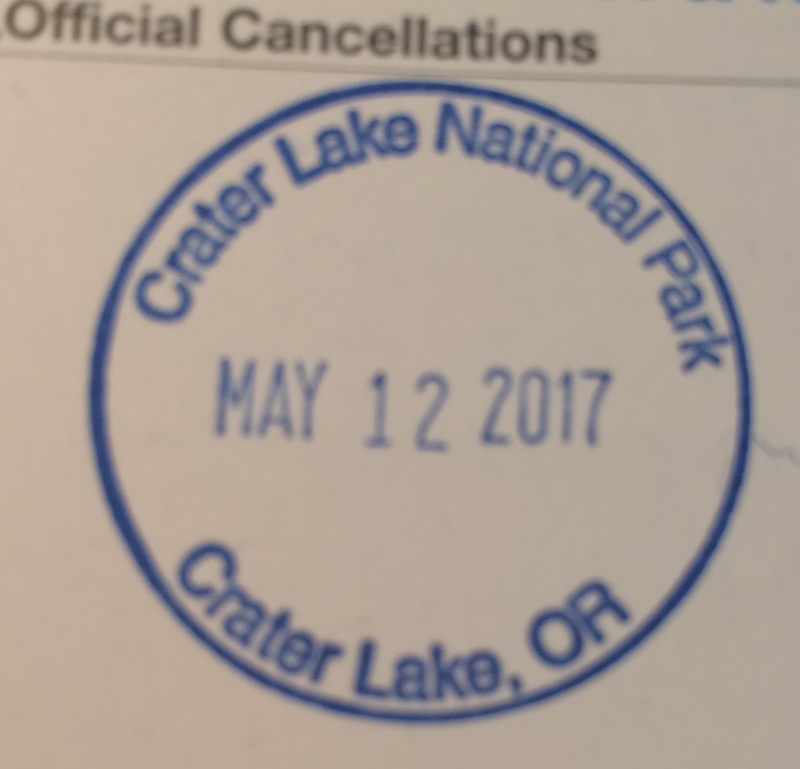 Have you visited Crater Lake? Leave a comment below on your experience. Click on the Follow link and get an email when new postings are available. I will not share your email so no worries. Plan for the right time of year to visit. Visit between July and October if you want to see the full lake. Winter sports are available if you visit between November and May. Average snow fall in May is 20 inches. Even June gets four inches of snow on average. Don’t expect to see much beyond Rim Village unless you are on snowshoe. One day is enough to see the lake but two days will allow better exploration of Wizard Island and its cinder cone. 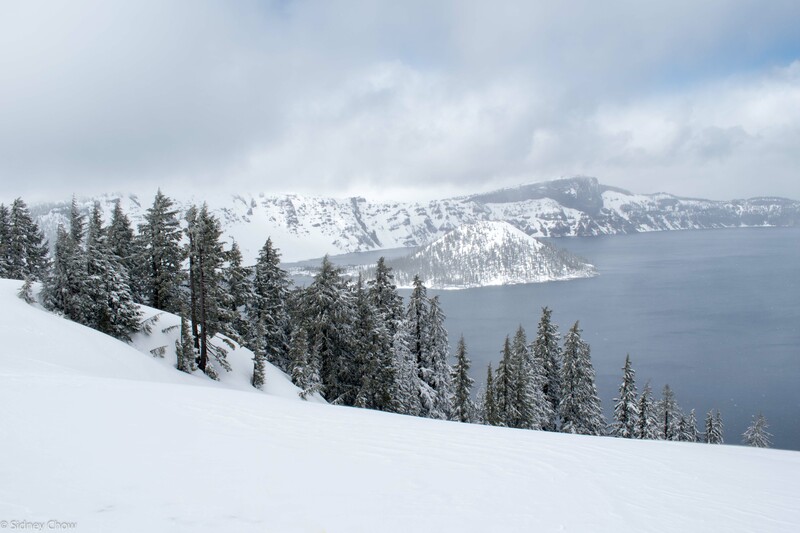 Crater Lake Lodge overlooks the beautiful lake, and is open from mid-May to mid-October. The Cabins at Mazama Village is open from late-May to mid-October. Food and gas are available in the park. Medford is a good gateway city, with plenty of services and an airport. Size: 183,224 acres, ranked 33rd. Visitors: 756,344 in 2016, a record year. Sidney, great job with the video, I need to pick your brain on editing technology! We went to Crater Lake a few years ago, and stayed at the lodge (good call, something special about walking around and viewing the lake at all different hours of the day). I’ll forever cherish the 4:30 am wakeup call my (then teenaged) daughter and I had to go get some sunrise pics from the Western edge of the lake. Special place, thanks for bringing back the memories! Fritz, Crater Lake is one park I will be back! It looks just so beautiful and changeable with weather, lighting and vantage point. I’d be happy to share anything I know about editing etc. Part o the fun of doing this is to learn about making a web site, photography, and video including editing. I sure wish I knew when I started this journey what I know now about these subjects. Send me an email on what you want to know! Thanks for the offer! I have a lunch with our AV guy from work, he’s a master at video editing, and has agreed to offer me some tips. I’ll see where I get with him, then reach out to you via email. Thanks again!